3D is the fourth studio album by American girl group TLC. It was released by Arista Records on October 10, 2002 in Europe, and on November 12, 2002, in the United States, seven months after the death of band member Lisa "Left Eye" Lopes. Recorded between May 2001 and July 2002, much of the album was finalized after Lopes's passing, with her unreleased material that she had recorded for her solo albums Supernova and N.I.N.A being reworked into new songs. Remaining group members Rozonda Thomas and Tionne Watkins consulted Rodney Jerkins, The Neptunes, Raphael Saadiq, Missy Elliott and Timbaland to work with them on 3D. The album debuted at number six on the US Billboard 200, and at number four on the Top R&B/Hip-Hop Albums chart, selling 143,000 copies sold in its first week of release and was met with positive reviews. The album nearly sold two million in the United States alone and was eventually certified platinum by the RIAA. 3D earned TLC two Grammy Award nominations and produced three singles, including "Girl Talk", peaking at 23 on the US Hot R&B/Hip-Hop Songs chart; "Hands Up", which peaked at number 7 on the Bubbling Under R&B/Hip-Hop Singles chart and "Damaged", which managed to peak at 19 on the US Mainstream Top 40. "I challenge Tionne 'Player' Watkins (T-Boz) and Rozonda 'Hater' Thomas (Chilli) to an album entitled The Challenge... a 3-CD set that contains three solo albums. Each (album)... will be due to the record label by October 1, 2000... I also challenge producer Dallas 'The Manipulator' Austin to produce all of the material and do it at a fraction of his normal rate. As I think about it, I'm sure LaFace would not mind throwing in a $1.5 million dollar prize for the winner." T-Boz and Chilli declined to take up "The Challenge", though Lopes always maintained it was a great idea. Things were heated between the ladies for some time, with Thomas speaking out against Lopes, calling her antics "selfish", "evil", and "heartless". TLC then addressed these fights by saying that they were very much like sisters that have their disagreements every now and then; as Lisa stated, "It's deeper than a working relationship. We have feelings for each other, which is why we get so mad at each other. I usually say that you cannot hate someone unless you love them. So, we love each other. That's the problem." The ladies eventually settled the feud, and “The Challenge” was never followed through. After the conclusion of the successful FanMail tour, the ladies, however, took some time off and pursued personal interests. Lopes was the first to begin recording her solo album, Supernova, however it underperformed internationally and was never released in the United States. During this time period, it was stated by Thomas she had begun working on a solo project and had realized that rumors of TLC's demise had taken over in the media. It was then that Thomas made a call to LaFace label-head L.A. Reid to discuss working on TLC's fourth studio album. After contacting Watkins, and soon after, Lopes, sessions for 3D had begun in the Fall of 2001. However, soon after recording had begun, sessions came to a halt, as Lopes began work on her second studio album, known as N.I.N.A (New Identity Non Applicable), and as Watkins was hospitalized in January 2002 due to complications stemming from her ongoing battle with sickle-cell anemia, Lopes eventually came to visit Watkins in the hospital and went back to the studio to record raps for 3D. In April 2002, as Watkins' condition improved greatly, Lopes disappeared to Honduras to do missionary work and also record a documentary film about her life. On April 25, 2002, Lopes was killed in a car crash, leaving behind material that she had recorded for both N.I.N.A and 3D. She was 30 years old. Watkins and Thomas decided to use three of Lopes' newly recorded raps for the album (Quickie, Girl Talk, and Who's It Gonna Be), the other songs that feature her in it were unreleased acappellas from her Supernova and N.I.N.A album sessions. The unreleased vocals were featured on the songs Quickie, Over Me and Give It To Me While It's Hot. Watkins and Thomas decided that they would complete the remainder of their fourth album, to be called 3D, which featured production from Rodney Jerkins, The Neptunes, Raphael Saadiq, Missy Elliott and Timbaland. The decision was also made that TLC would continue on as a duo rather than replace Lopes, and they announced in 2009 that they would possibly begin recording a fifth studio album, but still refused to replace Lopes. Upon release, 3D received generally positive reviews from music critics. At Metacritic, which assigns a weighted mean rating out of 100 to reviews from music critics, the album received an average score of 71, which indicates "generally favorable reviews", based on 14 reviews. Stephen Thomas Erlewine from Allmusic praised the album as "one of the best modern soul albums of 2002" and called it "a bittersweet triumph". He found that while 3D "perhaps doesn't blaze trails like their other albums, it never plays it safe and it always satisfies." Andy Battaglia of The A.V. Club wrote that "in spite of a slim body of songs and an occasionally half-finished feel, the group stakes a solid claim to the riches of future-soul with 3D, leaving a distinct stamp on even its weakest material with gorgeous singing built around the understated grace of '60s girl groups." Billboard magazine found that "with 3D, TLC has crafted a fitting tribute to a departed sister", calling it "a nearly perfect collection." David Browne, writer for Entertainment Weekly, remarked that "thanks to such hired guns as The Neptunes and Rodney Jerkins, TLC have made a better post-tragedy album than expected. 3D is a smorgasbord of modern R&B that ranges from silky to retro." He noted however that the album "still, feels a little incomplete, like much of their work." Rolling Stone writer Barry Walters concluded that "the album isn't the romp it might have been had Lopes survived, but 3D solidly embodies black pop in a year in which it has lacked a center." Dorian Lynskey from Blender felt that "3D's sheer creative vibrancy is itself a testament to Lopes's live-wire charisma", while Dimitri Ehrlich from Vibe noted that "while the CD is consistently well-produced and performed, the material recorded before Lopes’s death [...] is simply darker, sexier, and angrier." In the United States, 3D debuted at number six on the Billboard 200 and at number four on the Top R&B/Hip-Hop Albums chart. Selling 143,000 copies, it sold less than half of the first-week total scored by previous album FanMail (1999) which had opened at number one on the chart with 318,000 units. It also marked TLC's lowest-charting album since Ooooooohhh... On the TLC Tip (1992). 3D was eventually certified platinum by the Recording Industry Association of America (RIAA) for 1.0 million copies shipped to stores, and by 2004, had sold more than 680,000 units in the United States since its release. It ranked 63rd on the Top R&B/Hip-Hop Albums year-end chart. On international music markets, 3D failed to reach the top forty on the majority of the charts it appeared on except Canada where it managed to debut at number thirty-one on the Canadian Album Chart. However, the album peaked at number nine on the UK R&B Albums chart and also reached number two on the Japanese Albums Chart. In Japan, it was eventually certified platinum by the Recording Industry Association of Japan (RIAJ). 12. "Hey Hey Hey Hey"
13. "Give It to Me While It's Hot"
14. "Who's It Gonna Be?" "Quickie" contains voice samples from "Left Pimpin", a track from Lopes' unreleased N.I.N.A. album. "Over Me" uses a different take of a verse originally from "I Believe in Me", recorded for Supernova. "Give It to Me While It's Hot" reuses the second verse from "Friends", included on the Japanese edition of Supernova. ^ a b c Browne, David (November 8, 2002). "3D (2002): TLC". Entertainment Weekly. Archived from the original on 2007-05-26. Retrieved July 31, 2018. ^ Sinclair, Tom (1999-11-26). "Three To Tangle". ew.com. Archived from the original on 25 April 2009. Retrieved 2009-05-11. ^ Sinclair, Tom (2000-11-27). "Left Field". ew.com. Retrieved 2008-07-24. ^ Sinclair, Tom (1999-10-29). "Unpretty Situation". ew.com. Retrieved 2008-07-24. ^ Johnson, Jr., Billy (January 9, 2013). "T-Boz Resolved Differences With Left Eye Before Her Passing, Talks 'Totally T-Boz'". Rolling Stone. Retrieved February 21, 2019. ^ Vena, Jocelyn; Elias, Matt (2009-10-09). "TLC Ready To 'Change People's Lives' With New Music". mtv.com. Archived from the original on 22 October 2009. Retrieved 2009-11-14. ^ a b "3D Reviews, Ratings, Credits, and More at Metacritic". Metacritic. Retrieved 2012-05-31. ^ a b Erlewine, Stephen Thomas. "3D: TLC". AllMusic. Retrieved 2009-11-30. ^ Pendleton, Tonya (November 15, 2002). "TLC: 2D And Suffering". BET. Archived from the original on 2002-11-20. Retrieved July 31, 2018. ^ a b "3D". Billboard. November 16, 2002. Retrieved December 13, 2013. ^ Lynskey, Dorian (November 12, 2002). "R&B superstars lose a member but don't turn sentimental". Blender Magazine. Archived from the original on 2003-06-21. Retrieved July 31, 2018. ^ Lynch, Andrew. "TLC - 3D". Entertainment.ie. Retrieved 2009-11-30. ^ a b Walters, Barry (2002-11-04). "TLC: 3D". Rolling Stone. Archived from the original on 2002-12-23. Retrieved 2009-11-30. ^ Cinquemani, Sal. "TLC: 3D". Slant Magazine. Archived from the original on 2008-12-15. Retrieved 2009-11-30. ^ a b Ehrlich, Dimitri. "TLC - 3D (Arista)". VIBE. Archived from the original on October 20, 2006. Retrieved 2009-11-30. ^ Battaglia, Andy (December 16, 2014). "TLC: 3D". The A.V. Club. Retrieved November 27, 2002. ^ a b c "Jay-Z Scores 5th Chart-Topper With 'Blueprint'". Billboard. November 20, 2002. Retrieved December 13, 2013. ^ a b c "American album certifications – TLC". Recording Industry Association of America. Retrieved 2009-07-07. If necessary, click Advanced, then click Format, then select Album, then click SEARCH. ^ "Trio Pursues Its Sales Destiny". Billboard. November 27, 2004. Retrieved December 13, 2013. ^ "Dutchcharts.nl – TLC – 3D" (in Dutch). Hung Medien. Retrieved December 20, 2013. ^ "Lescharts.com – TLC – 3D". Hung Medien. Retrieved April 12, 2014. ^ "TLC – 3D". charts.de. Retrieved January 2, 2014. ^ Okamoto, Satoshi (2006). Oricon Album Chart Book: Complete Edition 1970–2005. Roppongi, Tokyo: Oricon Entertainment. ISBN 4-87131-077-9. ^ "Charts.org.nz – TLC – 3D". Hung Medien. Retrieved December 22, 2013. ^ "Official Scottish Albums Chart Top 100". Official Charts Company. Retrieved January 13, 2014. ^ "Swisscharts.com – TLC – 3D". Hung Medien. Retrieved January 8, 2014. ^ "Official Albums Chart Top 100". Official Charts Company. Retrieved January 13, 2014. ^ "Official R&B Albums Chart Top 40". Official Charts Company. Retrieved January 13, 2014. ^ "TLC Chart History (Billboard 200)". Billboard. Retrieved June 19, 2014. ^ "TLC Chart History (Top R&B/Hip-Hop Albums)". Billboard. Retrieved June 19, 2014. ^ "R&B/Hip-Hop Albums: Best of 2003". Billboard. Retrieved January 1, 2019. 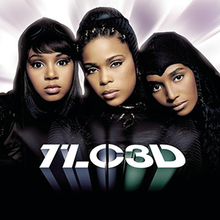 ^ "American album certifications – TLC – TLC"3D"". Recording Industry Association of America. Retrieved August 28, 2013. If necessary, click Advanced, then click Format, then select Album, then click SEARCH.